U.S. Secretary of State John Kerry is meeting with his Iranian counterpart, Mohammad Javad Zarif, in Switzerland this week to try to reach a framework deal on the future status of Iran’s nuclear program. The two are joined by negotiators from the other P5+1 countries (Britain, China, France, Germany and Russia) in an attempt to break a years-long impasse. It is difficult to predict how the public might react to an agreement on Iran’s nuclear program. But polls conducted over the past two years portray a public deeply concerned over the prospect of a nuclear-armed Iran and distrustful of Iran’s leaders. And when it comes to Iran’s nuclear program, as with so many other issues, there are deep divisions in the way that Republicans and Democrats view the situation. A poll last August showed that 59% of Americans saw Iran’s nuclear program as a major threat to the United States. Concern was especially strong among Republicans (74% major threat), while 56% of Democrats and 54% of independents agreed. In that same poll, 54% of Americans said that President Barack Obama was not tough enough in his approach to foreign policy, including 77% of Republicans. Furthermore, in a December 2013 poll, 44% disapproved of Obama’s handling of dealings with Iran, while 39% approved. About seven-in-ten Republicans (71%) disapproved, compared with 20% of Democrats. Following the announcement of an interim deal with Iran, temporarily halting Tehran’s nuclear program, a December 2013 poll found that 43% of Americans disapproved of the deal, with 58% of Republicans disapproving but only 27% of Democrats saying the same. The survey also showed that among Americans who had heard a lot or a little about international talks with Iran, 62% said the Iranian leadership was not serious about addressing international concerns about their country’s nuclear enrichment program. Again, 77% of Republicans said Tehran was not serious, while only 49% of Democrats agreed. This all comes in an atmosphere of mistrust toward Iran, not just among Americans, but in most of the world. A majority or plurality in 29 of 40 countries had an unfavorable opinion of Iran, including 76% of Americans, according to our spring 2014 poll. In that same poll, 16% of Americans said Iran was the country or group that posed the greatest threat to the U.S., ranking third behind nuclear powers Russia (23%) and China (19%). 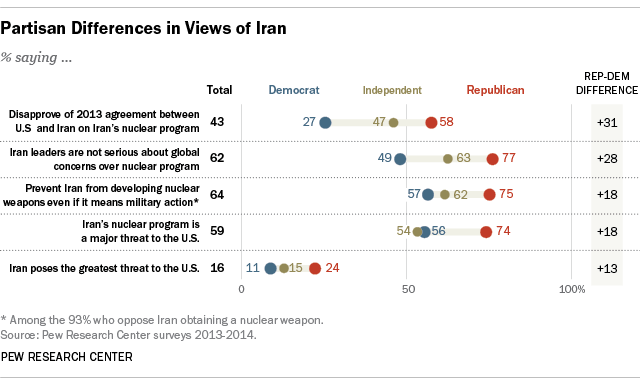 Those who saw Iran as the greatest threat included 24% of Republicans and 11% of Democrats. When we asked Americans about a nuclear-armed Iran in 2013, 93% said they opposed such an outcome. But of those respondents, 64% said it was more important to prevent Iran from obtaining a nuclear bomb, even through the use of military force; just 28% said it was more important to avoid a military conflict even if it meant nuclear weapons might be developed. Three-quarters of Republicans chose the military option, and 57% of Democrats said the same. Some more recent surveys have showed a public that is of two minds about the Iran issue. A Wall Street Journal/NBC News poll conducted earlier this month found that 71% of Americans did not believe that the negotiations with Tehran would make a real difference in preventing that nation from producing nuclear weapons. But a recent poll conducted by CNN, asking whether those surveyed favored or opposed direct negotiations between the U.S. and Iran on the subject, found 68% in favor of continuing the talks. Republicans were slightly less in favor of such negotiations (65%), compared with Democrats (77%) and independents (64%).